News broke on 7th June, 2016 that the German government would commence the supply of military hardware to support Nigeria’s elusive efforts in addressing her security challenges in the Northeast and Niger Delta regions. This declaration was made known in the presence of the Permanent Secretary, Nigeria Ministry of Defence, Amb. Danjuma Sheni by Germany’s Permanent Secretary, Foreign Office, Mr. Markus Elderer on Monday in Abuja, at the meeting of defence session of the Nigerian-Germany Bi-National Commission. 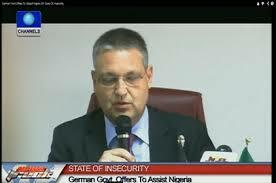 It is shocking that even after Germany and her Foreign Office Permanent Secretary, Mr. Elderer must have witnessed the current spate of widespread violence and gross human rights violations attributed to Nigerian government through her army, police and other security forces, would still go ahead to supply armaments to Nigeria’s corrupt military and defence industry. It should be recalled that the military wares supplied to the Nigerian military by China was what the Nigerian army used on innocent and unarmed Biafrans commemorating the passing of their fallen heroes during the 3years civil war on May 30th, 2016. The United Kingdom and United States had during the past administration, refused to supply ammunitions to Nigeria on the grounds of human rights abuses by the Nigerian troops, their lack of reliability and professionalism in discharging their duties. Now that substantiable innumerable gross human rights abuses by the Nigerian state has been recorded in Nigeria, why then would Germany proceed into negotiations of any military arms deal with the Federal government? Evidences abound of military brutality of innocent and unarmed civilians in Nigeria. A visible case of one of its critics watching the manner at which Biafra agitators were massacred on 30th May Heroes’ Remembrance Day, was dragged out of his vehicle and severely brutalized. Accountability remains seemingly impossible with regard to the numerous killings of unarmed civilians by the Nigerian military whom like their leader and Commander-In-Chief, has little or no regards to the rule of law and tenets of democracy. Till date, there have been no genuine or credible investigation of any police or military officer for the mass killings of Biafrans since August last year till now. Amnesty International and other human rights organizations and civil liberties has strongly condemned in its entirety, these continous abuses, urging the Nigerian government to release all political prisoners in their prisons like Nnamdi Kanu and ensure full accountability of mass killings of Biafran protesters in the country. But alas, the Nigerian government which has endorsed these killings and inhumane treatments on Biafrans has done nothing reasonable enough to abate the killings, it has rather worsened under the president’s watch. Therefore, it is either Mr. Elderer is not aware of the unbecoming atrocities of Nigeria and her army and has no idea about the evil being perpetrated by the current Nigerian administrators whom are practically demons walking in human skins or that he feigns ignorance of the apparent matter and choosing to turn a blind eye and a deaf ear to their atrocities. The current repressive regime of President Buhari having committed treason in 1983 and genocidal war crimes between 1967-70 against Biafrans is enough pointer and rational reasons why Germany should refrain or think twice before engaging in any form of arms deal with Nigeria, or are they saying they are oblivious of the massacre of 22 Biafrans praying at the National high school field in Aba, earlier this year on the 9th of February in which Buhari shamefully refused to watch the video clip of the atrocities committed by his authorized footsoldiers in an interview with an Aljazeera reporter? Moreover, he has repeatedly stated in no ambiguous terms that he doesn't mind killing Biafrans to prevent the division of Nigeria. In another occasion, he vomited that he ‘will not tolerate Biafra’, in another, he reiterated that it is better everybody drowns in an ocean than for Biafra to be restored. He has clearly made this fact known, which is verifiable anyway, that he would never be alive to witness Biafra restored while he openly supported and declared for the freedom and independence of the Palestinians and Western Sahara. Read also:JUST IN!!! THE AVENGERS: NIGERIA YOUR INJUSTICE IS TOO MUCH "ENOUGH IS ENOUGH"
His gross abuse of power and the attendant consequences is what has prompted the Niger Delta Avengers to spring up and rebel against not only his government, but the Nigerian state. The Niger Delta Avengers are not militants as people wrongly perceived, they are liberation fighters against innumerable injustices in Nigeria and their struggle for independence and self-governance which is recognized under the international law. I wonder why Germany would presume them to be part of Nigeria’s security threat when they had listed a handful of demands yet to be adopted by the Nigerian President. Instead of meeting up with their simple, credible and reasonable demands, the Nigerian government tagged them to be criminals, forcing Nigeria’s military brass to broaden their horizons in search of military cooperation from gullible countries they hope to deceive under the guise of fighting insurrection. Finally, Germany should not attach morality or civility to dealings with African countries especially Nigeria. They do so at their own peril. Nigeria is only but a mere geographical expression and a very slowly evolving nation. Micro-nationalistic tendencies still exist in her leaders, particularly in this current administrators they are dealing with and because of the tremendous powers the Central government wields, he does not ponder or think twice in undertaking a parochially punitive suppression of other perceived competing emerging nationalities within and opposing political tendencies with irreparable damage to democracy.